1773 – Death of James FitzGerald, 1st Duke of Leinster. James FitzGerald, 1st Duke of Leinster, etc. PC (Ire) (29 May 1722 – 19 November 1773), styled Lord Offaly until 1744 and known as The Earl of Kildare between 1744 and 1761 and as The Marquess of Kildare between 1761 and 1766, was an Irish nobleman, soldier and politician. He was the 20th Earl of Kildare and Baron of Offaly and was created 1st Viscount Leinster of Taplow in 1747 and 1st Duke of Leinster, 1st Marquess of Kildare and 1st Earl of Offaly in 1766. Leinster was the son of Robert FitzGerald, 19th Earl of Kildare, and Lady Mary, daughter of William O’Brien, 3rd Earl of Inchiquin. Leinster was a member of the Irish House of Commons for Athy from 1741 before succeeding his father as 20th Earl of Kildare in 1744. 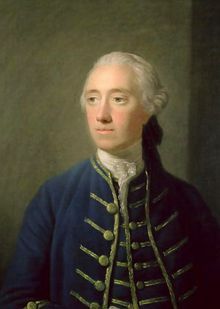 He was sworn of the Irish Privy Council in 1746 and in 1747, on the occasion of his marriage, he was created Viscount Leinster, of Taplow in the County of Buckingham, in the Peerage of Great Britain, and took his seat at Westminster that same year. From 1749 to 1755 he was one of the leaders of the Popular Party in Ireland, and served as the country’s Master-General of the Ordnance between 1758 and 1766, becoming Colonel of the Royal Irish Artillery in 1760. He was promoted to Major-General in 1761 and to Lieutenant-General in 1770. In 1761 Lord Kildare was created Earl of Offaly and Marquess of Kildare in the Peerage of Ireland and in 1766 he was further honoured when he was made Duke of Leinster, becoming by this time the Premier Duke, Marquess and Earl in the Peerage of Ireland. Leinster married the 15-year-old Lady Emily (6 October 1731 – London, 27 March 1814), daughter of Charles Lennox, 2nd Duke of Richmond and one of the famous Lennox Sisters, in London on 7 February 1747. She was descended from King Charles II and therefore a cousin of King George III. The couple had nineteen children (although the youngest child is believed to have been fathered by his children’s tutor and Emily’s lover, William Ogilvie). Their third son Lord Charles FitzGerald was created Baron Lecale in 1800; their fifth daughter Lady Charlotte FitzGerald was created Baroness Rayleigh in 1821; their fourth son Lord Henry FitzGerald was a politician; and their fifth son was the famous Irish revolutionary Lord Edward FitzGerald. Their sixth son, Lord Robert Stephen FitzGerald (15 January 1765 – 2 January 1833), was a British diplomat in Switzerland 1792-1795, married on 22 July 1792 Sophia Charlotte Fielding (died 19 September 1834) and had: George FitzGerald (24 December 1809 – 29 January 1853), married on 8 September 1834 Mary Barton (died 25 January 1866), without issue; Mathilda FitzGerald (31 March 1793 – 11 March 1850), married on 24 December 1817 Chevalier Victor Marion de Gaja; and Sophia Charlotte FitzGerald (14 March 1799 – 19 March 1875), married on 20 October 1831 The Rev. Henry Dalton (died February 1870). Other children were: George FitzGerald, Earl of Offaly (15 January 1748 – Richmond House, 26 September 1765); Lady Emily FitzGerald (15 March 1751 – 8 April 1818), married in Ireland on 20 August 1774 to Charles Coote, 1st Earl of Bellomont (baptized 12 April 1738 – 20 October 1800); Lady Sophia Sarah Mary FitzGerald (died 21 March 1845), unmarried and without issue; and Lady Lucy Anne FitzGerald (5 February 1771 – 1851), married on 31 July 1802 to Sir Thomas Foley (1757 – Portsmouth, 9 January 1833). Leinster died at Leinster House, Dublin, in November 1773, aged 51, and was buried in the city’s Christ Church Cathedral. He was succeeded by his second but eldest surviving son, William, Marquess of Kildare. The Duchess of Leinster caused a minor sensation by marrying her lover William Ogilvie in 1774, but continued to be known as The Dowager Duchess of Leinster. She had a further three children by him. She died in London in March 1814, aged 82. 1913 – Irish Citizen Army is founded.